Julia de la Torre '98 shares Moldova's spring traditions while volunteering with the Peace Corps. Note: Julia de la Torre '98 is currently serving as a Peace Corps volunteer in the country of Moldova, and will share her experiences as part of an occasional series for news@haverford. To view other articles in this series, click on June 2004, August 2004, October 2004, and January 2005. Monday, March 1, was the first day of spring here in Moldova. 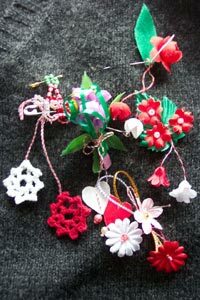 With this holiday comes the tradition of Martisor. This holiday is unlike anything I have seen before and is also celebrated in Romania and Bulgaria, Moldova's neighbors. I have heard many legends related to Martisor since being in Moldova, but one of them is particularly impressive and has stuck with me since my first spring celebration last year. Legend has it that a long, long, time ago, a dragon had captured the sun as he was dancing one day. The world grieved for the loss of the sunâ€”no one sang or danced, the birds disappeared, and people were found in a deep sorrow. No one dared to fight the dragon. But one day, a brave man decided to save the sun. Everyone saw him off on his journey, wishing him well and praying for his safe return. He walked for three seasons until at the end of winter, the brave man found the dragon's castle. They fought and fought, shedding blood on the white snow, until the brave man won. The snow quickly melted and the sun was freed, returning to the sky. Nature started to wake up and the first flower of spring, the snowdrop, started to open. But the brave man did not survive. He suffered for days and on the first of March, he shed his last drop of blood on the snow, where the rest of spring's flowers soon bloomed. Today, in memory of the brave man who saved the sun, people give each other hand-made red and white pins on March 1 to represent the coming of spring. The red represents love and the brave man's blood. The white represents health and purity and the first snowdrop flower of spring. Because so many of these handcrafted pins are given, some people have their shirts covered with them. Each one is just a little bit different, showing the character and love of the person that made it. Martisor are worn for an entire month and after March has ended, it is typical to hang your pins on the trees in your yard, in order to bring forth luck and a good harvest. Last year, I chose to hang my Martisor on the apricot trees in my yard, and I'm happy to report that I enjoyed copious amounts of fruit all summer.